This is a little-referenced General Conference talk by Elder Gary Stevenson from April 2009 but it resonated with me. My wife and I have had a long-standing discussion regarding the decor of our home. We both grew up in homes that lacked religious iconography but for different reasons. Her family chose to not have pictures of Jesus Christ and my family were atheists and didn't really believe in a Savior. Thus, my wife is not a fan of the Americanized Redeemer adorning the walls of our home while I, on the other hand, feel that I need reminders to "remember Him always" and like for my home to be my family's own mini-temple. Let the debate begin. As you can imagine, we've had many colorful, intelligent dialogues about this issue. We've compromised by having symbolic images, photographs of trees (the Sacred Grove), pictures of family, and a limited number of LDS Church distribution-type of pictures on our walls. Not that it necessarily scored me any points in the on-going debate between my wife and me on this issue, but when I heard Elder Stevenson's sermon I smiled a little inside. 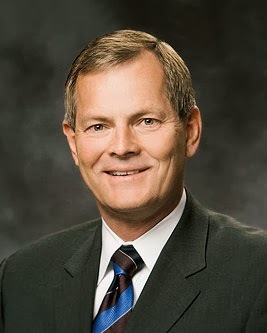 Recently, in a stake conference, all present were invited by the visiting authority, Elder Glen Jenson, an Area Seventy, to take a virtual tour of their homes using their spiritual eyes. I would like to invite each of you to do this also. Wherever your home may be and whatever its configuration, the application of eternal gospel principles within its walls is universal. Imagine that you are opening your front door and walking inside your home. What do you see, and how do you feel? Is it a place of love, peace, and refuge from the world, as is the temple? Is it clean and orderly? As you walk through the rooms of your home, do you see uplifting images which include appropriate pictures of the temple and the Savior? Is your bedroom or sleeping area a place for personal prayer? Is your gathering area or kitchen a place where food is prepared and enjoyed together, allowing uplifting conversation and family time? Are scriptures found in a room where the family can study, pray, and learn together? Can you find your personal gospel study space? Does the music you hear or the entertainment you see, online or otherwise, offend the Spirit? Is the conversation uplifting and without contention? That concludes our tour. Perhaps you, as I, found a few spots that need some "home improvement" — hopefully not an "extreme home makeover." Because you know my stance on the issue, I'm sure you won't be surprised that I love this talk. With the world becoming more violent, crude, and lascivious, it is hard to come by a place of refuge. If the temple represents the epitome of holy sites on this earth, why wouldn't you and I want to make our homes just as holy, just as peaceful, just as welcoming to the Holy Ghost and the Savior? I was once told that Elder Kikuchi an emeritus Seventy had a room in his home that had all white carpet and two white chairs. He said it was his meditation room or "personal gospel study space." Someone asked him why he had two chairs and he said that it was so that if the Savior visited him, Jesus would have a place to sit. I always think of that when I consider my home: Do I have a seat for Jesus? Would He want to even come into my home? Am I in the right spirit so that I would want Him to come into my home? What's your view on the debate?